As we do not manufacture any extraction units, we design our systems incorporating many different manufacturers, such as Absolent, Dustcheck, Heaton Green, Donaldson, Nederman and many more. 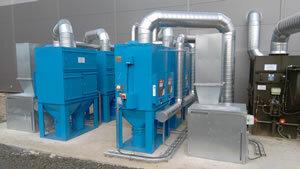 We design systems that incoporate the most suitable extraction unit. On occasion, clients may wish to have continuity with extraction unit types, therefore we will always consider the client's preferences when specifying a system.